Have you seen Ivory (left) and Meeka (right) pictured below? They are two of the late Marsha Howard's beloved pet dogs who have been missing in the Glendale area since Marsha's death last November. For more information, see my valleynews.com story here. The first disinterment to take place at Grand View, since all the legal troubles began there, went off without a hitch yesterday. Bob Garcin, a former Glendale mayor, had the ashes of his father and stepmother transferred to Eternal Hills Memorial Park in Oceanside. Read my eyewitness account here. Also, the next regularly scheduled status conference for the class action lawsuit against Grand View takes place tomorrow, Thursday, May 3, at 10:30 a.m. It's open to the public. More details here. "The mausoleum door is open!" Reader asks: is Grand View a "Biker" cemetery? 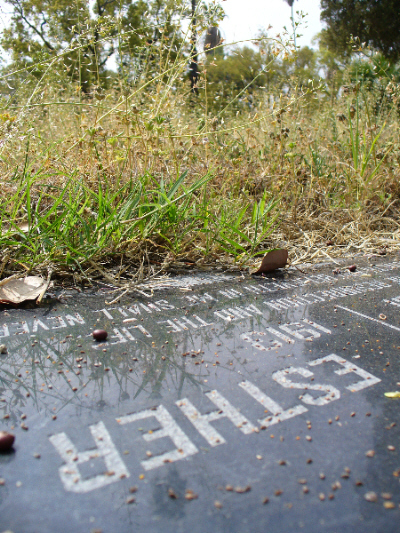 ValleyNews.com reader Sharon Hoyt was told by a Grand View employee back in 2002 that the graves of two of her relatives buried there were unmarked. Sharon thought that was weird, and together we embarked on a gravehunt like none I've experienced before. Read the full details here on my ValleyNews.com blog. As outlined here in the previous post, potential first evidence of on-going allegations about the double-selling of plots at Grand View was uncovered this week when cemetery workers prepping a site for a court-ordered burial discovered what appeared to be a casket-protection vault in what should have been an unused grave site. Read a detailed account of the discovery process in my latest ValleyNews.com post, Two Bodies and a Cancelled Funeral at Grand View. Esther Lohr, 94, passed away last November but she wasn't buried next to her husband, Lee, until March 20 and it took a court order to get her laid to rest in her final place of choice: Grand View. Something rotten in Glendale (2/6/2006) - lawyers were looking for business documents inside the caretaker's residence Tuesday and were met with foul odors. Sundays attract regulars and new visitors alike (2/10/2006) - a piece that profiles some of the fine folks I've met at Grand View during recent limited visitations. Lots of news developing on the Grand View Memorial front this week, including a court-ordered burial (the first in seven months!) hundreds of boxes of evidence being processed and what Marsha Howard was wearing when she died last November...all included in my latest news round-up tonight on ValleyNews.com. I started blogging about Grand View for the LA Daily News' citizen journalist website last summer in order to chronicle the goings on at my neighborhood cemetery. The experience has turned into a cyber community service of sorts, as readers write to find out about the condition of their loved ones' graves there - from there the hunt is on, to find the headstones, clean them up and take pictures to email back to the families who live outside the LA-area. Read about two of my recent "finds" at ValleyNews.com blog.